In the era of the staycation, travel writing offers a metaphorically transporting way to experience distant realms. With the “Cities” issue, we sought pieces that captured the flavour of a place without sacrificing narrative: more literary than literal guide. The fiction, memoir, reportage and poetry we ended up with convey a strong sense of a particular city (or an imagined one) while keeping character, plot and style to the fore. We were delighted to find an abundance of captivating pieces that whisk the reader around the world, across Europe, America, Asia, and even into the dystopian urban future. The range among the non-fiction offerings has never been broader, from Emma Rault’s Brit’s-eye-view of LA (“Los Angeles, Seen from a Tree”) to Cheryl Lynn Smart’s impassioned in-depth report on the housing projects of Memphis (“The Bricks”). Judith Roney poetically takes the pulse of Orlando following last year’s nightclub shootings in “<80 BPM”, while Conor Montague depicts backpackers in Gorakhpur with comic flair in “The Integrity of Cockroaches”. In addition to poems distilling key aspects of Paris and New York, Dundee and Liverpool, of particular note is the winning entry in Shooter’s inaugural Poetry Competition. Miriam Celeste Ramos scooped the prize with “The Long Arm” for its raw energy, surging Beat-style rhythm, and emotional power. Her poem, along with that of runner-up Stephen Williams, also appears online. Many of the issue’s short stories play with perception as well as place. Paul Blaney’s “A Lisbon Story” seemed a good choice to open the edition given its sharp sense of setting and the kind of questions it raises about identity and invention, opportunities for which cities so frequently present. Sarah Evans, in “The Architecture of Emotion”, reflects her main character’s inner turmoil in London’s outer landscape. Dave Wakely’s “In the Gut” also elegantly explores heartache, this time in the Maltese capital of Valletta, while the protagonist in P W Lewis’s “A Tale of Two” becomes mired in a murky world of art and infidelity in Vienna. Culture clash emerges as another common theme. Máire Cooney’s Glaswegian schoolgirl has trouble adjusting to Edinburgh life in “Nobody Said Anything”. A stint teaching English in Hong Kong shatters the main character’s illusions in Joshan Esfandiari Martin’s “Charmed Lives”. And not just culture but survival clashes loom in Malachi King’s “The Waters of Michigan”, when two post-apocalyptic survivors roam an unnamed city, dreaming of a better place. When cities become visions of hell, what idyll beckons with greatest allure? The country. To order a copy, please visit the Subscriptions page. While we wait for the “Cities” issue to return from the printers, writers can sharpen their pencils and flex their fingers in preparation for the summer issue’s theme: “Bad Girls”. As the peerless Rebecca Solnit writes in the London Review of Books about the US election, “One got the impression that any power a woman had was too much, and that a lot of men found women very scary.” In line with the kind of women feared by patriarchy, Shooter seeks literary short fiction, non-fiction and poetry featuring not the Playboyesque, video-game, comic-book notions of Bad Girls, but defiant women who speak up and act out. We want to read about convention-defying antiheroines and unapologetic badasses who carve their own path. Give us the antics and mishaps of adventurers, intrepid souls and challenging contrarians, but make sure these characters are surprising and complex rather than reductive and cartoonish. Non-fiction that deals with topical feminist issues and women in male-dominated environments is particularly welcome. As usual, we prefer poetry that inclines to the observational rather than experimental end of the spectrum. Please read the Submission Guidelines for information on how to submit. Writers may send one prose piece (between 2,000 and 7,500 words) and/or up to three poems to submissions.shooterlitmag@gmail.com by April 2nd, 2017, for inclusion in the summer issue. Submissions are also open for Shooter’s 2017 Short Story Competition, which carries a slightly later deadline of April 16th, 2017, with no restrictions on theme. Please go here to read more on how to submit to the competition – we look forward to reading your work! Miriam Celeste Ramos has won Shooter’s inaugural Poetry Competition with “The Long Arm”, a free-verse poem that impressed the contest’s readers with its raw energy and emotional power. Ramos, a New Yorker living in London, said she originally wrote the poem to be performed aloud – fitting for verse with a strong voice and insistent, Beat-style rhythm. In addition to poetry, Ramos has written fiction, films and essays; more about her work can be found at www.miriamisms.tumblr.com. As the winning entry, “The Long Arm” appears in Shooter Issue #5 (to be released next week), as well as online here. A humorous poem, “B&Q Blues” by Stephen Williams, finished second in the contest and also appears online. Williams writes comic poetry and teaches secondary school English in North Yorkshire; he maintains a poetry website at www.jiggerypoetry.com. All winners from Shooter’s short story and poetry competitions can be found on the Competition Winners page. 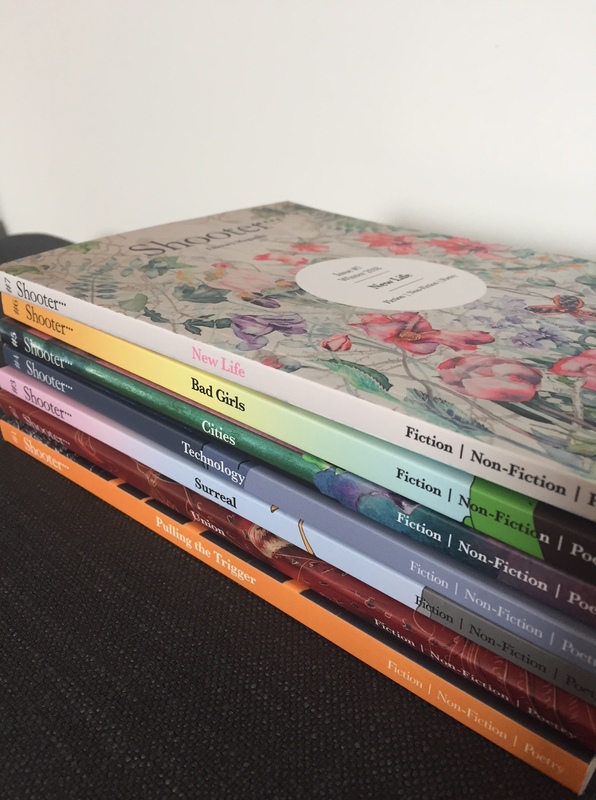 The 2017 Short Story Competition will open for submissions next week (along with submissions for Shooter’s summer issue), and the Poetry Competition will return in August – stay tuned for further details! If you’re looking for a little late summer diversion, both the winner and runner-up of Shooter’s 2016 Short Story Competition are now available online for your reading pleasure. Ka Bradley’s winning tale, “Examination for Empathy, Sympathy, Emotion (ESE) 004”, appeared on the website in conjunction with the launch of Issue #4: Technology, in which the story also appeared. The competition runner-up, Laura Lamb’s “The Collector”, is posted exclusively on Shooter’s website. Inventively framed and immediately absorbing, “Examination for Empathy, Sympathy, Emotion (ESE) 004” zeroes in on the minutiae of a miserable commuter experience, with darkly humorous, razor-sharp observation. “The Collector”, a whimsical and imaginative fable, depicts the unusual way a man manages to conquer his fear of public speaking. These winning stories exhibit different literary strengths and styles, but both amount to the kind of work that Shooter seeks to champion: original ideas and execution, beautifully wrought language, an intriguing premise, compelling characters and, fundamentally, writing that appeals to both the head and the heart. You, the reader, can play an important role in helping to support these new writers by sharing links to their work on Facebook, Twitter and elsewhere, and, if you like what you read, please feel free to leave comments. Our next story competition will open in January 2017 but, until then, we hope you’ll enjoy these winning tales from our inaugural contest! The fifth issue of Shooter Literary Magazine will take the geographic theme of Cities, drawing upon the vitality and diversity of urban life – or, depending on the writer’s perspective, the grinding challenges of the crowded, fast-paced metropolis. Writers may submit short fiction, non-fiction and poetry to do with historic, contemporary or futuristic cities, engaging with some aspect of the politics, pressures and allure of the urban experience. On the non-fiction side, insightful travel pieces revealing something unusual or unique about any city around the world are especially welcome. Prose should fall between 2,000 and 7,500 words, and poets may submit up to three poems by October 16th, 2016. As always, Shooter seeks to uphold a high literary standard, so the quality of the writing is paramount. A vividly conjured urban setting is not enough to make a compelling story: we’re looking for pieces that explore some aspect of human experience unique to a city, stories that lead with character and illuminate the universal by means of the particular. Similarly, sharply observational, insightful poetry is preferred to obscure experimental fare. For further guidelines on how to submit to Issue #5, please visit the Submissions page.